Rachel Parsons (right) and Miguel Desmarais prepare for an experiment using samples collected at the BATS site in the Sargasso Sea. Photo by Michael Parsons. Three students who have worked as interns with BIOS microbiologist Rachel Parsons since 2016 will present their research findings this month at the Ocean Sciences meeting in Portland, Oregon. Petra Byl, a student from the University of Chicago who worked as an intern in 2016 through the Research Experience for Undergraduates (REU) program, looked at the biogeochemistry of water at Devil’s Hole, a collapsed cave in Harrington Sound, Bermuda. During the summer, microbes grow and respire using up the oxygen at the seafloor. Because Devil’s Hole has relatively low water flow, the water column does not mix and the oxygen near the bottom is not replenished. Petra was able to determine the chemistry changes as the oxygen was consumed and, using microscopy and molecular methods, what microbes were able to survive in this oxygen-depleted environment. 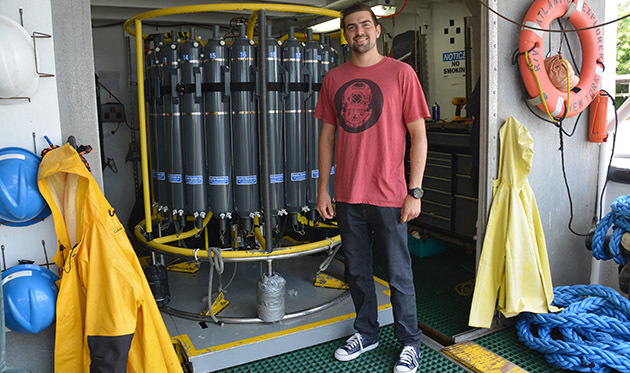 Quinn Montgomery worked on the research vessel Atlantic Explorer in the fall of 2016 to recover a CTD (used to measure conductivity, temperature and depth in the water column). The instrument gathers water samples in the attached bottles from a variety of depths, which helps scientists precisely determine the essential physical properties of water. Photo by Michael Parsons. Quinn Montgomery, also a REU intern hailing from the University of San Diego, investigated the seasonal changes in the plankton community at a long-term ocean-monitoring site, the Bermuda Atlantic Time-series Study (BATS). 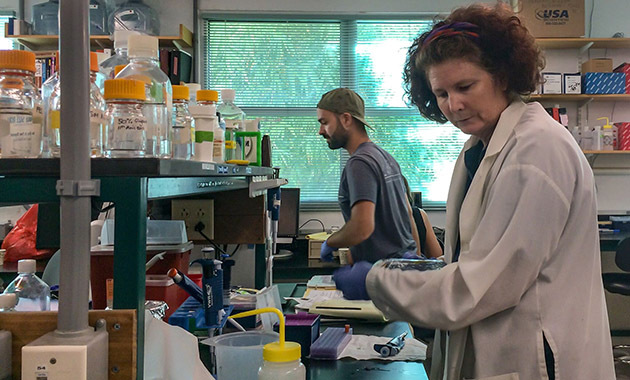 Montgomery focused on a project looking at variations in phytoplankton—the tiny plants important for carbon storage in the ocean that are major producers of oxygen on Earth and a fundamental food source for marine life. Miguel Desmarais was an intern in 2016 and 2017 and his participation at Ocean Sciences is funded by the Canadian Associates of BIOS, Parsons’ research funds, and the University of British Columbia. During his time at BIOS, he determined what specific microbial lineages, or group types, were found within the ocean’s twilight zone, where light is limited and oxygen levels are lower. Petra Byl (right) and Brett Jameson, both former interns at BIOS, co-authored the research on bacteria that survives in areas with low oxygen. Byl will present their results at the February meeting of Ocean Sciences. Photo by Michael Parsons.